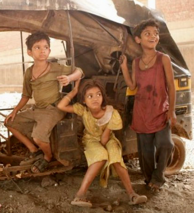 The producers of Slumdog Millionaire have donated 500,000 pounds to a child development organization that works in the slums of Mumbai to support education and healthcare programs. I feel obligated to note the good things they’re doing after slamming them a few months ago for not providing for the child actors in the movie. Good news: the producers of Slumdog Millionaire are furnishing the child stars of the movie with new homes and transportation to school every day. That’s great news after last month’s story about the brutal conditions that they faced. The two child stars of Slumdog Millionaire who hail from the slums of Mumbai will be in attendance at the Oscars. Two of the child stars of Slumdog Millionaire apparently still live in abject poverty in the slums of India. This is one of the saddest things I’ve read. It would be unjustifiable under any circumstances, but particularly in this case because the children play major parts in the movie and act incredibly well. To make a movie that in part serves to highlight the plight of children in India that at the same time exploits the children involved is not the kind of irony one can laugh about. Rubina and Azharuddin live a few hundreds yards from each other in a tangle of makeshift shacks alongside Mumbai’s railway tracks at Bandra. Azharuddin is in fact worse off than he was during filming: his family’s illegal hut was demolished by the local authorities and he now sleeps under a sheet of plastic tarpaulin with his father, who suffers from tuberculosis. For purposes of comparison, here’s a slide show of some of the gifts in the gift bag given to Academy Award presenters. Maybe they should have asked to be allowed to present at the Academy Awards in lieu of payment. I think the Internet and the cable systems have a long way to go before streaming video or even high-definition movies on demand become a meaningful replacement for something like Blu-Ray. For the vast majority of Americans, it currently takes far too long to download a high-definition movie for it to be convenient, and while cable systems are doing a better job of offering high-definition films on demand, the supply is (at least in New York) minuscule, and the quality is nowhere near as high as Blu-Ray offers. Blu-Ray’s real problem, it seems to me, is much simpler: it’s too expensive. It seems to me though that what we have is a race — will digital downloads get better and more accessible before Blu-Ray gets cheap enough to be competitive? A friend of mine was asking me which Blu-Ray player he should buy, and I told him he should buy a DVD player for $40 and wait a year. Either Bl-Ray players and discs will be a lot cheaper, or it won’t matter because you’ll be able to download most of the things you want from Netflix and watch them on demand.